There are definite rules when it comes to labeling clothing items as chinos or khakis. The bad news is that manufacturers and advertisers don’t necessarily seem to know them. In fact, some manufacturers even label chino pants as khakis and vice versa. When even clothing companies confuse them for each other, it’s hard to know the difference between the two. If you’re one of the many people who are confused, don’t worry. Here’s the down-low on the defining differences between chinos and khakis, when it’s appropriate to wear each and what they can be paired with to achieve the best style. As lightweight, thinner pants, chinos generally have a slimmer, straight cut. The biggest difference is the fit. 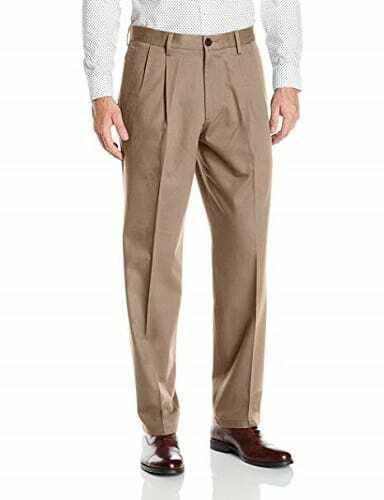 The front of chino pants generally has no pleat or crease. Instead, they are flat – simple and straightforward. Shaped to fit snug, chinos are slightly more slimming and stylish than their boxy, utilitarian cousin, the khaki. There is also more color variation when it comes to chinos, as they can reasonably range from pinkish salmon colors all the way to neutral browns. Additionally, they are generally made out of a lighter fabric, which makes them an ideal addition to your summer wardrobe. Chinos typically have smaller, vertical pockets and a slightly younger, more hip, upscale aura. To ask which came first, the chino or the khaki isn’t quite as philosophical as the infamous chicken/egg question and thankfully it’s not nearly as controversial, either. Alternately, chinos stepped on stage just a handful of years later than khakis, in 1898. Interestingly, they have similar military roots to their khaki competitors. However, chinos were manufactured first during the Spanish-American war, during which they were made in China and therefore dubbed by Spaniards Pantalones Chinos. In Spanish, this means, Chinese pants, a term that was soon chopped and shortened by Americans into simply chinos. Now, we use the word chino to refer to a more stylish, modern variation of those pants. Khakis often feature a double or single pleat on the front of the pants. This refers to the straight, folded feature that runs down the front of the leg. Khakis are also normally cuffed at the bottom, which causes the pant leg to taper, while chino pants fall straight. The cut also tends to cause a bit of gathering of material between the calf and ankle, which is a preferred style for some, although it does make you look slightly shorter. Made of a material that is thicker and heavier, khakis tend to be a more popular option for fall and wintertime wardrobes. Some variations of khakis are quite utilitarian and are commonly worn in work situations, though dressier, more stylish options are readily available. In the fit, they are generally less slimming and slightly boxier, with larger, deeper pockets that can accommodate your keys, a pocket knife and all wallet types. Fashion historians pretty widely accepted that khaki pants first stepped into the scene back in December of 1848. They were sported first by a regiment of the British Indian army called the Corps of Guides, who were stationed in dusty, sandy regions. This gave way to the need for a tactical, durable fabric that was functional enough to blend with the color of the region’s dry soil and also formal enough to be accepted as officers’ wear. With these needs in mind, khaki pants were born. At first, the word khaki (which is Persian word for soil or dust) referred solely to the pants beige color, although now it is more a reference to the pants’ fabric and overall style and fit. The terms chino and khaki are not to be used interchangeably. At times mistaken for each other, chino pants and khaki pants technically do vary slightly in appearance and construction. The difference is mostly defined by the fit, material thickness and overall aesthetic. Of course, there’s no hard-and-fast guidebook or law-enforcing army who patrols to define the correct terms for pants and ensure the right labels are being placed on the correct clothing item. For that reason, sadly, there’s a lot of muddling and confusion when it comes to defining and differentiating between khakis and chinos in any official way. In fact, you might even find some rogue, wild clothing tags containing both the words khaki and chino smashed into their description with no conceivable acknowledgment of the fact that these are completely different fabrics and styles. These few defining characteristics do separate a classic khaki from chino pants, but it’s also important to remember that when it comes to pants, the world of men’s fashion is a wild, lawless land full of exceptions and rule breaking. It is, in this way, entirely possible to have a pair of khaki pants with small pockets, no pleats or no cuffs. All standards are generalizations, not hard and fast rules. Whether you’re on the hunt for a pair of chinos or wanting to purchase a good pair of khakis, you want to look for a tag that boasts 100% cotton. Just like when you’re shopping for socks for men, products that are entirely made of cotton as opposed to synthetic or acrylic are lighter, cooler and breathe easier. This increased airflow doesn’t just add comfortability, it can actually make the pants more durable. Chino pants are ideally made of a lightweight 100% cotton or a fabric that is cotton blended with another fabric in a close-knit weave. Meanwhile, khaki pants are normally made out of a heavyweight 100% cotton twill fabric. The term cotton twill is a type of fabric commonly used in clothing, which is created using a diagonal weave which promotes durability and is generally slightly thicker. If chinos are a refined, cabernet-sipping law school graduate at the departments informal Christmas party, then khaki pants are his slightly lankier, middle-of-the-line craft-beer guzzling cousin. Both are nice dudes who are decent enough to receive an invitation to the event in the first place, but one’s definitely got a little more class. In short, khakis are a bit less formal than their chino cousins and should be worn accordingly. With khakis, appropriate footwear can range to accommodate everything from your beat-up skater shoes to posh boat shoes and just about everything in between. Some popular footwear choices might include men’s chelsea boots or perhaps a pair of the stylish chukka boots for a unique, smart-casual look with a more formal twist. Popularly paired with a casual polo or a T-shirt, shirts can be worn with khakis tucked or untucked. Which you choose should depend on the formality of the event you’re attending and the rest of your ensemble. The key is simply to find a balance between smart and casual. When it comes to color, there are hard fast rules for khakis. Although some brands do manufacture shades of khaki pants in bright red, vibrant blues or other loud and unusual colors, avoid them like the plague. Instead, stick to the classics. Dust and tan colors are a great go-to and a timeless choice for the semi-smart dress. Anything outside of those neutral colors may be regarded as ridiculous. Like all types of jeans for men, khakis can be worn quite casually with a T-shirt and athletic shoes, skate shoes or casual loafers if you wish. There’s a lot of versatility. That’s not to say that you can wear khakis with anything because, in the wrong clothing ensemble, even a nice pair of khakis can look dumpy and unkempt. However, paired with the right polo, a good blazer or wool sweater, you can look nice and even dapper in a good pair of khakis. In fact, Paul Newman is known for sporting tan khakis with a wool sweater. JFK frequently appeared in public looking sharp and classic in a pair of khakis, too and with careful attention, you can as well. In comparison to their khaki cousins, chinos achieve a slimmer, modern fit. These pants are often regarded as more formal or smart, merely due to the fact that current trends in men’s clothing dictate that slim fit is in fashion. That being said, their tapered leg and straight lines are somehow trendy and also timeless. The unpleated, flat front of the pants works with the lines of the body to elongate the legs and make you appear taller, which has always been in vogue. The style’s fitted shape can also have a slimming effect, which easily adds to its popularity. Chinos are also versatile pants. They are prim enough to be worn to special occasions but relaxed enough to also be appropriate for a quick dinner of a few beers with the boys. They can be paired with just about anything from a nice Oxford button-up to one of your trademarked T-shirts. Like khakis, shirts can be worn with chinos either tucked or untucked, depending on the shirt and what style you’re striving for. Remember, a good rule of thumb is that shirts with a flat hem (such as T-shirts) are generally meant to be worn untucked. Meanwhile, shirts with curved or tail-like hems are normally intended to be tucked in and topped off with the best belt for men. Like a good babysitter, chino pants come with more freedom and fewer rules. By offering more color versatility, they’re a bolder, more expressive choice. In short, we’re not going to say that you definitely should go for the wilder colored products like blues, light reds or even pink, but we’ll admit we’re open-minded to it. Of course, that’s not to say that chinos are a one-pass for a classy look. It’s still definitely possible to look like a dumpster fire in a pair of nice pants if the pants fit wrong or look goofy or the color is vomit inducing. With chinos especially, the sizing is essential. If the size is off, you may as well be trying to pass off pajamas with long sleeves as a dress shirt. The fit is key and you’re going to notice the difference in fit between high end and low-end chinos. Quality products will keep a slim fit, a waistline that sits perfectly and a straight, sleek line that slims your body, elongate your legs and compliments your build. This sought-after style can sometimes require the help of a tailor. It’s pricey, sure, but sometimes worth the investment for a style that can potentially last for years and years to come. Lastly, it’s essential to get down to the nitty-gritty and talk about what matters and that’s what goes underneath. Because chinos are made from a finer, thinner material and have a snugger fit, some men also wear silk boxers and find them a great way to promote comfort and keep visible boxer lines from showing up in broad daylight. So now you’ve sorted the chinos from the khakis. You know what’s what, but which one best fits your style and needs? In short, chinos are lighter, slimmer and better for those wanting to expand their summer wardrobe. They have a wider accepted range of colors and can popularly be found in pastels as well as neutrals. This makes them an excellent choice for the stylishly adventurous or those looking to add a bit of flair to their normal day-to-day wear. Meanwhile, khakis are a bit more casual, thicker and slightly more functional in style. Their pockets tend to be larger, their fit is looser and their material is mildly more durable, making them ideal for those who are harder on their clothing or those who prefer a bit of room to move in. They’re ideal for those focused on practicality and those who prefer looser, more durable clothing. In the end, it all comes down to personal preference and the needs of your lifestyle. Still can’t decide? The good news is it’s quite easy to find a great pair of either khakis or chinos. If you can’t decide between the two, maybe you should think about just springing for both. 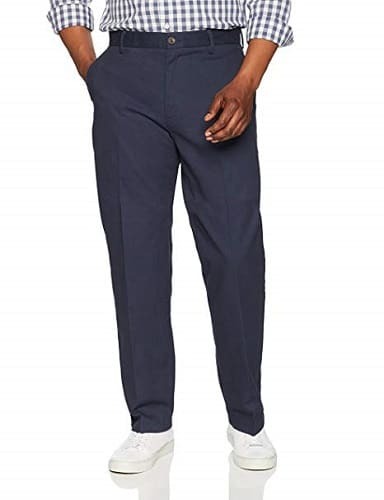 With a good looking design and made with high-quality cotton and polyester, Amazon Essentials Chino Pants are super comfortable and will make you the center of attention wherever you show up. Unlike their competitors, these pants have wrinkle-resistant properties, therefore you need not worry about the development of creases. Besides looking extremely classy, they’re made to fit perfectly on your waist and give your legs and thighs sufficient room, so you can relax, sit and stand comfortably. Their cool design involves a zip fly with great button closure, straight legs, button pockets at the back and side pockets. Maintaining them is very easy because they’re machine washable and take a pretty short time to iron. They’re available in a few colors you can match with your top and shoes to look even more handsome. 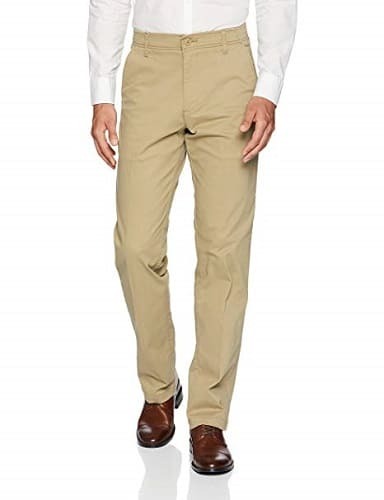 If you’re looking for nice fitting pants that are stain resistant, not too wrinkly and comfortable, this model of IZOD Chinos is the best choice to make. They’re designed with pure cotton which makes them extremely comfortable. The design is amazing and they also fit well because they aren’t too wide or too skinny. They also have good looking, double-welt back pockets and side slash pockets. The cotton is slightly thick, which makes this pair warm. Compared to other trousers in the market, they’re very lightweight, hence suitable for your everyday activities. Most men love them because they look classy when worn with anything from flex button to polo shirts. 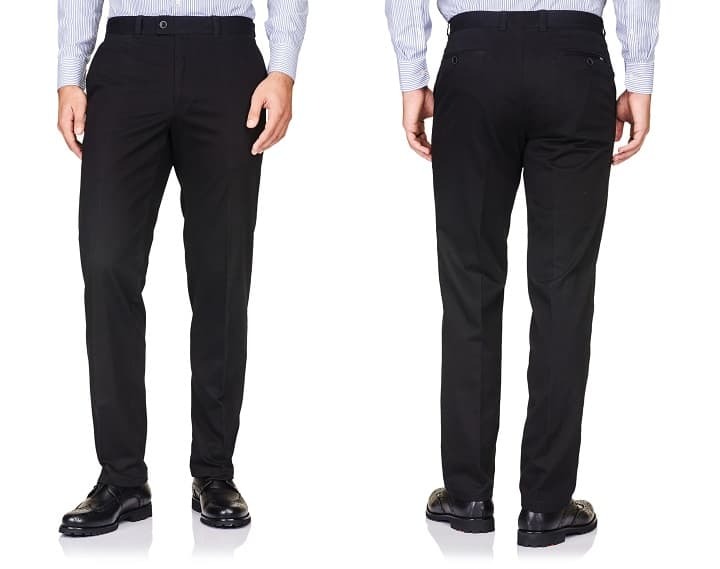 Are you looking for comfortable office pants? Volcom Chino Pants might be a good choice for you because they’re designed with high-quality cotton, polyester and elastane which make them very comfortable, stretchy and versatile. What makes them even greater for your office work or other daily routines is the fact they’re very roomy for you to sit and walk without feeling discomfort in your legs, thighs and waist. If you have an athletic type of body, you’ll find this pair to be very spacious. They look classier than standard trousers and are great to wear with a button-down shirt or a T-shirt. The material also feels pretty nice and the pockets are deep enough to be functional. 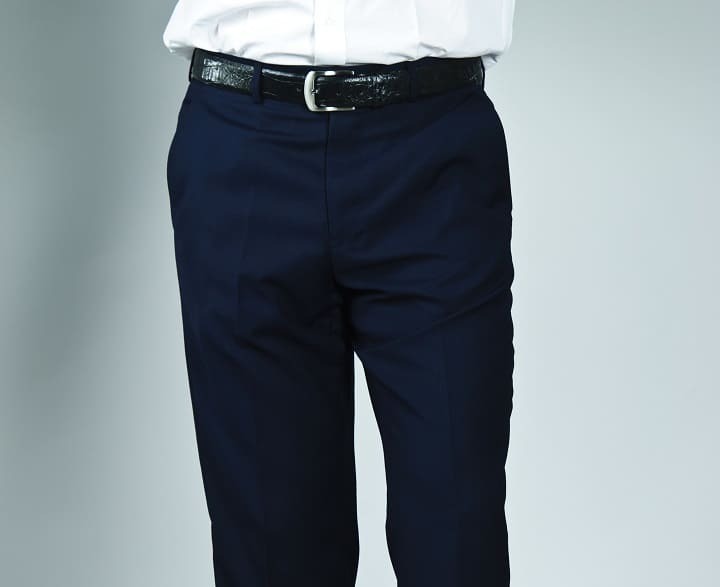 These pants are available in different colors, so you can choose ones according to your taste. They’re also machine washable and the wrinkle-resistant properties make them ready for wearing straight from the drier. Thoughtfully designed with cotton and spandex, LEE Khaki Pants are all you need to look stylish. Most men love their stretchy material that makes movement in any direction easy and effortless. They’re crafted to feel extremely comfortable, have a flexible waistband and an active comfort fabric that work together in giving you an all-day comfort that you can rely on whether at the office or a club with friends. Other than being comfortable, these pants also look very good. They have great looking back and side pockets which are very stretchy and comfortable as well. Available in a lot of colors and perfectly fitting, they don’t get wrinkly after washing. You can wash them and put in the drier for a few minutes before hang drying. 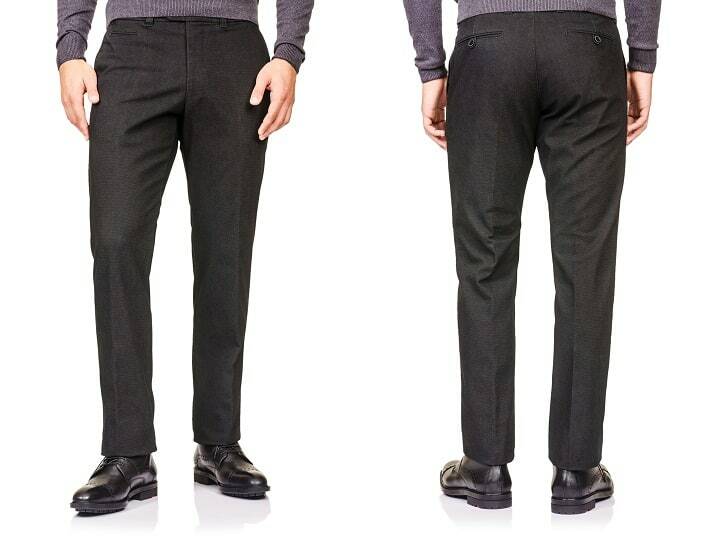 Manufactured with cotton and elastane, Dockers Pants feel extremely comfortable. Their fabric is stretchy and provides an all day long comfort. This enables you to sit naturally without feeling unbearable tightness around your thighs and legs. The pair is also designed with a no wrinkles technology. For more comfort and flexibility, they’re fitted with a waistband to help give you more room around the waist. Their classic design features a great button closure, nice side seam pockets and button through the pockets. Furthermore, they have fine top stitching, a zip fly with button-through front closure and great welt button-on back pockets. 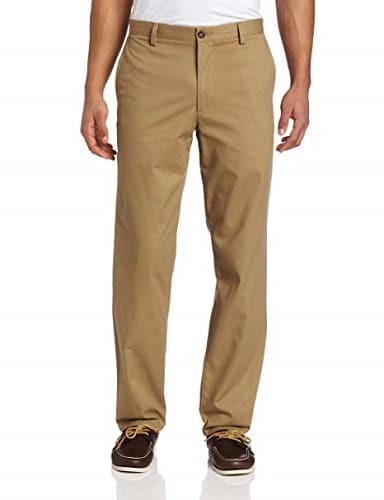 There are a lot of reasons to recommend Dockers Khaki Pants with a straight fit. Their material consists of 40% polyester and 60% cotton. They’re perfect for work because they come in a lot of colors and therefore you can wear them to numerous casual settings like at the club or at the party, among the others. With a design that features a zip fly with button closure, nice welts pockets at the back and a waistband, this pair creates more waist room and offers more comfort. They are generally roomy around the legs and thighs, hence you can rely on them while sitting at the office desk or having fun with friends at the club after your working shift. Available in numerous straight fitting sizes and more than one color to select from, they’re very easy to clean. You simply need to toss them inside a washing machine and then in the drier for a few minutes before hang drying them in a well-ventilated area. As with most clothing, the instructions for washing and caring for your chino pants should be detailed on the label. If you’ve gone the extra mile to purchase a pair of tailored chinos that will last for years to come, you probably want to take extra good care of them. Thankfully, that’s not very hard to do, as most chinos only require standard washing methods. As with most other cotton pants, you’ll want to wash these in a cold or warm wash cycle. They can be washed with your regular laundry, but try to avoid hot settings to avoid shrinkage. Many brands can be tumble dried completely, but it’s better to air dry them or take them out around ten minutes before the tumble cycle ends. This not only helps maintain their fit and feel but also can help reduce wrinkles. 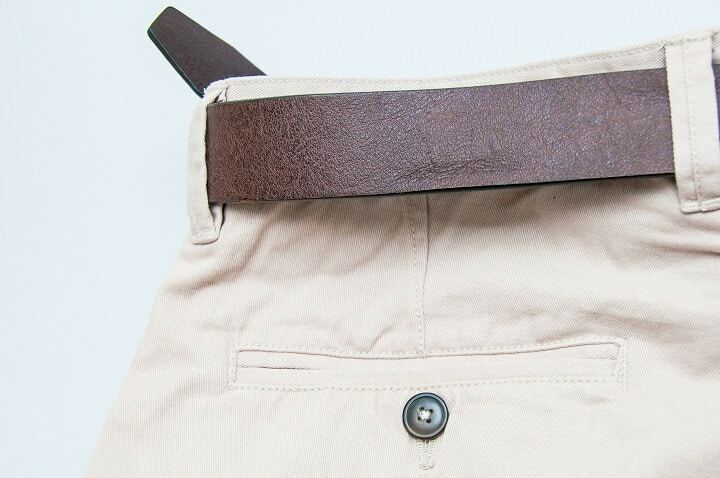 Chinos will probably stretch in the course of wear, especially in the waist as well as the seat and knees. This should be taken into account when you’re sizing a new pair. How much a pair stretches will depend mostly on the fabric and its cotton/polyester blend. Because so much of the appeal is their slim fit, a pair of stretched-out chinos is understandably not ideal. High-quality chinos are less likely to stretch but are still liable to extend slightly especially in the waist. The procedure to iron chinos is very similar to the process of ironing khakis, except that you will want to iron these with no crease. Therefore, the only differing step comes with how the pants are placed on the board. First, remove your chinos from the dryer before the cycle completes. Again, it’s much easier to iron damp cotton pants than dry ones. Instead of lining up the seams to iron the pants and pressing in a crease, you’ll want to lay the pant leg flat along the length of the ironing board, with the back pockets flat against the board. Iron the pant leg from the bottom of the leg up, pressing out any wrinkles. Then, flip the pant leg over and perform the same to the other side. Do this to both legs until your pants are pressed and wrinkle-free. Then, hang them up carefully until they’re ready to be worn. The great thing about khakis is that unless they have visibly accumulated dirt, they’ve become soiled or you’ve sweated in them, you don’t need to wash them each time you wear them. Standardly, you can get at least two days of wear in before your khakis need to be cleaned. When that time does come, khakis are easy and drama-free to wash. The good news is you won’t need to baby them. They don’t require special attention or additional trips to the laundromat. These can be treated with standard stain removers and washed with normal detergent along with the rest of your laundry of similar colors. However, you may want to take a slight amount of care when drying your khaki pants. As with all cotton-made items, they are liable to shrink slightly on a dryer set to a high heat setting. They’re not so delicate that they must be air-dried, but to prevent dramatic shrinkage, you should think about drying them on a cooler setting or removing them from the machine 15 minutes before the cycle ends. All materials stretch to some degree, some more noticeable than others. As khakis are made of thicker cotton, it’s a generally more durable material that tends to stretch less. The keyword here, of course, is less. This is not to say that they won’t stretch at all. In fact, they probably will. 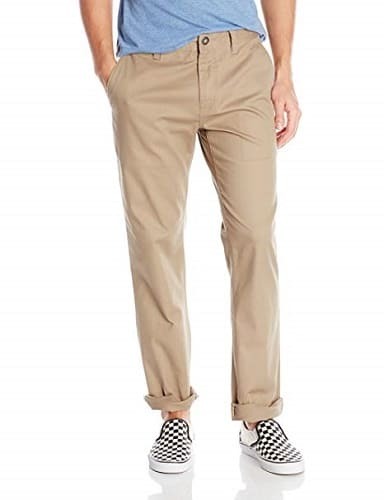 Especially after several washes, your khaki pants will become increasingly susceptible to stretching around the waist and at the knees. However, the stretching of khakis is significantly less drastic than the stretching that happens with chinos. This is due in part to their thicker fabric and also due to their looser fit. Because khakis have a more relaxed fit, there’s less friction on the fabric which in turn minimizes stretching and loss of form. Additionally, it’s less noticeable when a pair of khaki pants stretches and loses its forms slightly, as their intended fit is not as snug as chinos. If your khakis do stretch or lose form in the knees or seat of the pants, a little ironing can usually serve to minimize the problem. 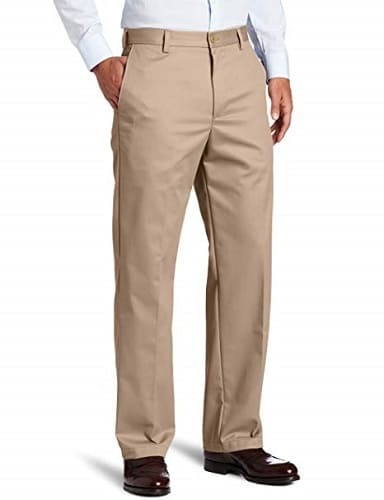 Unlike traditional trousers, it’s not absolutely mandatory that you iron khakis, but in some cases, it’s preferred. If you want your pants to have the formal appearance of creases or plats, you’ll probably need to iron it to achieve them. If you don’t care to iron a crease onto your pants, but you still want to wear them wrinkle-free, you might be able to get away with not ironing them. Simply remove them from the dryer before the cycle has completed and hang them while they’re still slightly damp. Depending on the material, some pairs will then dry relatively wrinkle-free. Alternatively, you can usually pull the wrinkles out of a pair of khakis fairly easily using a hair dryer or anti-wrinkle spray. If these methods aren’t quite cutting it for you (or if you’d like to iron a crease into your khakis), then you can use them in combination with each other or throw in the white flag and break out the ironing board. The first step is always to set up and secure the ironing board. Next, consult the clothing label of your khakis to find the suggested ironing temperature. Set your iron to that temperature. Lay the khakis flat on the board, with the legs lined up and on top of each other. If you wish to iron a crease into your khakis, you’ll want to make sure you position both seams directly over each other to assure the crease appears perfectly in the center of the leg and not offset to the left or the right. Gently fold back the top leg away from the bottom leg. Lay a wet cloth over the bottom trouser leg and iron it. Fold the ironed trouser leg back up and extend the unironed leg to be ironed. Lastly, flip the pants over and perform the same to the opposite side. Be sure in all cases that the in-seems are properly lined up. After ironing, carefully hang the khakis to maintain the pants’ shape until you want to wear them. Then, switch off your iron and let it cool before storing it. Women have leggings. For awhile the world of men’s fashion was behind in the realm of comfort that could pass as stylish. There was no cozy, stylish, flexible option for days when the idea of just wearing pants seems a bit appalling. That is until a miraculous invention called stretch chino entered the scene. Stretch chinos are made to move with you. Equipped with an elastic waistband, they are less restrictive than traditional waistbands while still delivering the sleekness of a regular chino. In short, stretch chinos don’t sacrifice comfort for style. Though their similarities may outweigh their differences, chino and khaki pants are undeniably entirely separate things. Both are incredibly versatile clothing options, great for garden parties, boat trips, social gatherings or even beers with bros. They can both be modernized with a trendy polo or turned retro with a pair of the best suspenders. Which you choose just depends on your personal style and needs. Can’t decide? The good news is that there’s a place for both of them in your life and wardrobe, so why not buy one of each? Photos from: AndrewLozovyi / depositphotos.com, Elnur_ / depositphotos.com, kk_tt / depositphotos.com and Manowar1973 / depositphotos.com.